Our rare boutique hotel is your retreat from the ordinary. Set on a hilltop, among sweeping views of vineyards and cypress, we offer four luxury rooms and seven signature suites in the medieval village of Castiglioncello del Trinoro. 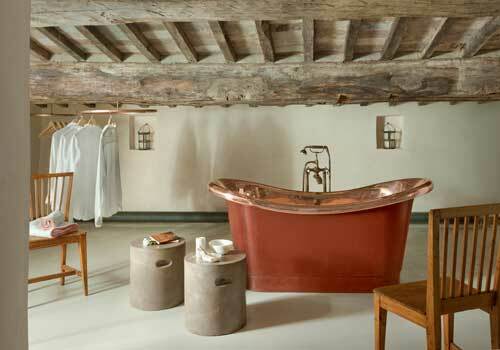 Rich in history and character, each bedroom and bath is a uniquely designed and decorated slice of Tuscan life. 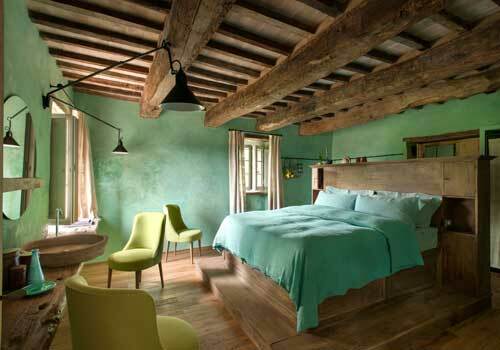 Designer Ilaria Miani imparted a soothing and contemporary aesthetic to the rooms centuries-old wooden beams, and brought in the finest linens, fabrics and custom-made furniture. All rooms have complimentary Wi-Fi, sparkling and still water, fresh flowers, an individual thermostat, room safe, flat-screen TV, and satellite TV in multiple languages. Attentive housekeeping and turndown serviceoccur daily. Our guests have full access to Monteverdi’s gym, pool and terraced gardens. In addition, a complimentary continental breakfast is served daily at Monteverdi’s Oreade restaurant. Customers outside the US will be charged at international direct dial rates. Customers outside Italy will be charged at international direct dial rates.